Shortly, by January of next year, educational tours at the Clark Museum will never be dull again as students and other young visitors can expect a more upbeat setting and could just tap, swipe, bump or whatever else they can do with their fingers on story lines they prefer to peruse. Visitors can also better assess historical features and images from exhibit to exhibit or experience watching the eruption of Mt. Pinatubo on a 4D theatre or a 3D movie with sensor-equipped motion seats, wind, strobe, fog, rain and scents. Architect Lala Rodriguez, a member of the taskforce APEC which handles infrastructure matters related to the 2015 Asia Pacific Economic Cooperation (APEC) summit said this is going to be the setup of the new Clark Museum that CDC President/CEO Arthur Tugade aspires for the Freeport and wants to showcase to the foreign delegates starting next year. “From the usual dull and dim, the museum will this time turn into a more enthusiastic, colorful and comprehensive institution coupled with ‘cool’ technology to live up to the expectations of the younger audience and meet as well the demands of the new generation,’’ she added. Rodriguez said the CDC has allocated P13-million for the improvement of the museum on top of the P5-million that has been allotted for the construction of the shell of the extended building for the theater and some P10-million earmarked to purchase the 4D technology. 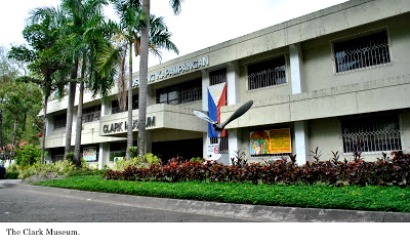 The two-story museum will house many of the old photographs, artifacts and replicas among others significant to the history of Clark and of Pampanga but with added molding and framing to rouse the interest of students and tourists alike, she explained. Among the exhibits that will occupy the first floor include countless pictures, scenic dioramas, relics, true-to-life replicas and murals during the American time, the Aetas and Clark’s metamorphosis from a former US military air base to a thriving industrial hub; while the second floor will display the scale model of Mt. Pinatubo and will feature as well Pampanga’s rich cultural heritage. The newest feature inside the museum, the 4D theater, will allow visitors to view the eruption of Mt. Pinatubo back in 1991 with spectacular in-theater effects including wind, bubbles and mist to add a breathtaking fourth dimension. “Students or the younger generation will finally be able to relate to the past and be educated on how the eruption of the volcano created massive damage not only to Pampanga and the region but as well the entire country,’’ said Rodriguez. According to her, President Tugade is thinking forward and wants to engage the visitors especially the younger generation physically, emotionally and intellectually. Moreover, Tourism and Promotions manager Noemi Garcia said the number of visits and educational tours is expected to increase when the new Clark Museum opens to the public next year. "Clark's daily visitors may even double once it is known that we have upgraded our gallery and we are more proactive in dealing with the needs of our future audiences,'' she said.